Harry Kane and Raheem Sterling were also on target as Gareth Southgate’s side ran out convincing winners. It was another superb performance from England. ENGLAND WERE FORCED to come from behind to continue their perfect start to Euro 2020 qualifying with Ross Barkley scoring twice in a 5-1 win on Monday. Marko Vesovic stunned Gareth Southgate’s men early on, but after drawing on their two previous visits to Podgorica, England showed why their current crop are among the favourites to be European champions next year. Michael Keane’s header restored parity before Barkley’s double either side of half-time put the visitors in command and Harry Kane and Raheem Sterling rounded off a comprehensive victory. England already now have a stranglehold on qualifying Group A with six points and 10 goals from their opening two games. The atmosphere failed to match Southgate’s pre-match warnings of an intimidating venue for the visitors, but the home fans who did attend were given hope of a massive upset 18 minutes in when Vesovic turned inside Keane and curled past Jordan Pickford. England are not used to falling behind these days, but showed a resilience to bounce back that points a growing maturity of the Three Lions despite the tender age of many in the squad. Barkley may not have started but for injuries to others, but the Chelsea midfielder grabbed his opportunity with his first England goals since 2015. Keane made amends for his earlier error with a commanding header from Barkley’s free-kick on the half hour mark to settle England’s nerves. However, there was one more moment of concern for the visitors when Fatos Beciraj fired a great chance wide after Danny Rose was caught in possession inside his own area. 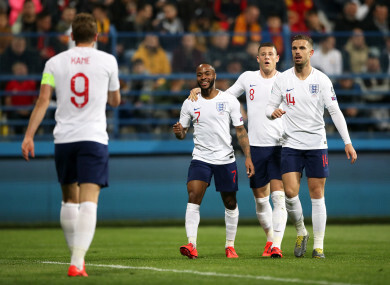 Instead of being pulled back, further goals from Barkley, Kane and Sterling rounded off an excellent start to qualifying for England after a 5-0 thrashing of Czech Republic on Friday. And after scoring just twice in his first 45 caps, Sterling now has six goals in his last four England games as he raced onto Jordan Henderson’s through ball before slotting low past the goalkeeper. Email “Barkley brace helps England hammer Montenegro to maintain perfect start to qualifiers ”. Feedback on “Barkley brace helps England hammer Montenegro to maintain perfect start to qualifiers ”.